Making honey can be a pain­ful busi­ness! 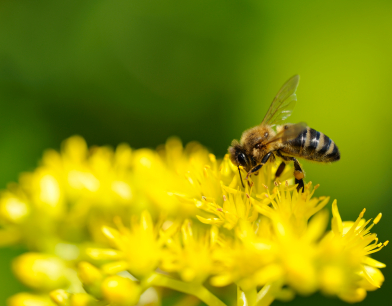 The symp­toms of a bee sting are known to many of us – burn­ing, sting­ing, red­ness, swell­ing – all the effects of a for­eign object (stinger) and sub­stance (venom) being in our body, and our body’s attempt to get rid of it! When it comes to bee stings, a homeo­path­ic rem­edy called Apis is the answer to this dis­com­fort. Disclaimer: If you have had a history of anaphylaxis (a severe allergic reaction to a bee sting) in the past, that apis should under no circumstances be used in the place of an EpiPen (epinephrine injection) or Benadryl. Homeopathy, for those of you who are unfa­mil­i­ar, is a meth­od of ther­apy where “like cures like”. Akin to a vac­cine that is giv­en with dena­tured or dis­rup­ted ele­ments of a vir­us to stim­u­late our immune response, a homeo­path­ic sub­stance is a dilute ver­sion of a mater­i­al that is presen­ted to our bod­ies that are exper­i­en­cing those symp­toms. Something to add to the first aid kit! You’ll know if this will work for your sting with­in 15 – 20 mins at the most.